 The author of several lighthearted romances sequined with one- word titles (Deception, 1993, etc.) again sets her fragile mystery and sportive verbal and physical foreplay in what seems to be the Regency era. This time a proud noble is reined in for cozy loving and lusting by another feisty Quick heroine, an ex-schoolteacher knowledgeable about classical antiquities. The supposedly widowed Iphiginia Bright dresses in virginal white and swans about in a little white and gilt carriage, encouraging the ton to believe she was the mistress of Marcus Cloud, Earl of Masters, whom she assumes is dead. He's not. There's much fuss and fuming as she tries to explain to Marcus that her masquerade was aimed at catching the blackmailer of her Aunt Zoe. (This makes as much sense to the reader as it does to Marcus, but who cares?) Other blackmail attempts come to light as Marcus and Iphiginia sleuth, separately and together, and he investigates her foggy past. (Was there a Mr. Bright?) The pair, in and out of harness, meet in unlikely places: a graveyard crypt, a hall of naughty statuary, and the forthrightly titled ``Dr. Hardstaff's Museum of the Goddesses of Manly Vigor.'' Eventually blackmail victims will be forced to exhume old secrets while Marcus and Iphiginia parry and thrust (more parry than thrust) to overturn Marcus's rules concerning messing with virgins, remarrying, or revealing the past. At the close the culprit is cornered in Dr. Hardstaff's establishment. 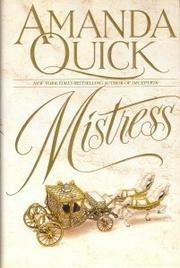 As usual, Quick's heroine is bright and relentlessly bubbly, while her unbending toff finally softens to a jelly bean. Occasionally there are flashes of wit through the coy formula romance, as in this view of a dancing crowd: ``Shimmers of excitement ruffled their gaudy wings. Greedy anticipation lit their hard, faceted eyes.'' Reliable. Surefire. Bestselling.